Among the National Cutting Horse Association (NCHA) and cutting horse industry, Metallic Cat is a widely recognized name. The 2005 red roan Quarter Horse stallion, out of High Brow Cat and Chers Shadow by Peptoboonsmal, debuted in the futurity with trainer Beau Galyean and retired 12 shows later after never losing a cow throughout his entire show career. He was the 2008 NCHA Open Futurity Champion and NCHA Horse of the Year in 2009 as well as the top money earning horse all ages all divisions and Derby Open Champion at the 2009 Breeder’s Invitational (BI). Metallic Cat, also known as “Denver,” has lifetime earnings of $637,711, earned from all 12 of the shows he competed in. He is the 2nd highest money earning stallion in the history of the NCHA (following Smart Little Lena) and the highest money earning stallion within the last 33 years. 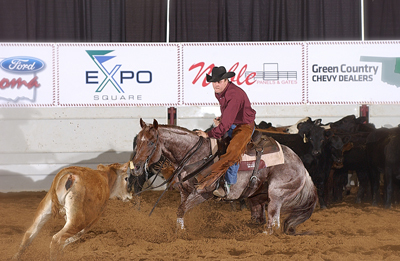 As a retired NCHA champion, Metallic Cat (owned by the Fults family) now spends his days at Fults Ranch in Amarillo, Texas breeding new champions to continue to live out his legacy within the cutting industry. There are currently 34 offspring of Metallic Cat actively competing, including Metallika out of Metallic Cat and Nyoka Pep by Dual Pep. Metallika (owned by Scotty Rice) was the Derby Open Champion at the 2014 BI recently held on May 10 – 14 in Tulsa, Oklahoma with a score of 225 shown by trainer and Scotty’s brother, Tag Rice. Metallic Cat is the first stallion to ever win the BI himself and then sire an offspring (Metallika) to also win the BI. This has been a huge accomplishment within the cutting sport and for Metallic Cat as a sire. In addition, other offspring of Metallic Cat who experienced success at this year’s BI were Metallic Jones (out of Metallic Cat and Smart Starlight by Smart Little Lena) owned by Kelsey Lee Weeks and shown by Kathy Daughn and Kelsey Weeks, who was a Non Pro Derby Finalist finishing in 4th. Meteles Cat (out of Metallic Cat and Teles Lies by Lenas Telesis) owned and shown by Cody Hedlund was a Non Pro Derby Reserve Champion and an Open Derby Finalist. Metallic Warrior (out of Metallic Cat and One Time Soon by Smart Little Lena) owned by Jessica Banuelos and shown by Adan and Jessica Banuelos, was an Open Derby Finalist. Sannman (out of Metallic Cat and The Smart Look by Smart Little Lena) owned by Galyean and Fults and shown by Beau Galyean, was an Open Derby Finalist finishing in 3rd. Sweetallic (out of Metallic Cat and Sweet Little Boon by Smart Little Lena) owned by Julie Sheedy and shown by Eddie Flynn was a Non Pro Derby Ltd Reserve Champion, Non Pro Derby Finalist, Amateur Derby Champion, and an Unlimited Derby Finalist finishing in 4th. Dr Metallica (out of Metallic Cat and Nurse Gray by Grays Starlight) owned by Dottie St. Clair Hill and shown by Gary Gonsalves was a Derby Unlimited Amateur Finalist finishing in 4th and a Derby Amateur Finalist. Sweet Metallic (out of Metallic Cat and Sweet Abra by Abrakadabracre) owned by Beau and Ashley Galyean and shown by Ashley Galyean, was an Open Derby 10k Finalist, Non Pro Derby Ltd Finalist finishing in 5th, and a Non Pro 10k Finalist finishing in 4th. Metallic Cat also broke a new personal record at the 2014 BI with his offspring surpassing the earning amount of his own Sire’s earnings. The 27-year-old sire, High Brow Cat, was the top sire earner at the BI until son, Metallic Cat, exceeded his father’s earnings and became the new top earner. Metallic Cat’s 12 offspring that competed at the 2014 BI, all 4-year-olds, earned a total of $260,402, while High Brow Cat’s 27 offspring ranging from 4 to 6-year-olds earned a total of $227,576. Metallic Cat has proven to be a top cutting horse sire, creating quality competitive cutting horses time after time. The two main traits Metallic Cat passes on to his offspring, according to owner Alvin Fults, is his near perfect conformation and cow smarts. These two traits combine to make well rounded, easily trainable, and successful offspring within the cutting industry. Even with all of the success Metallic Cat has had as a sire already, he has no plans of slowing down anytime soon.